A new molecularly imprinted polymer (MIP) has been prepared on silica beads using the radical “grafting from” polymerization method for selective extraction of minor contaminant mycotoxin of patulin (PTL). After the introduction of amino groups onto the silica surface with 3-aminopropyltriethoxysilane, azo initiator onto the silica surface was achieved by the reaction of surface amino groups with 4,4′-azobis(4-cyanopentanoic acid). The scale-up synthesis of MIP was then carried out in the presence of 6-hydroxynicotinic acid as template substitute, functional, and cross-linking monomers. The prepared sorbent was characterized using FT-IR spectroscopy, scanning electron microscopy, elemental analysis, and the adsorption–desorption selectivity, and the capacity characteristic of the polymer was investigated by a conventional batch adsorption test and Scatchard plot analysis. 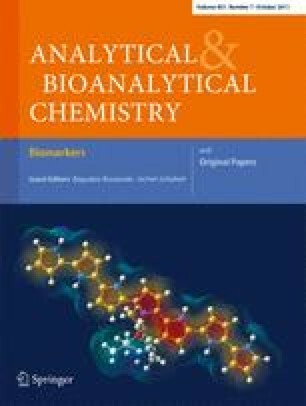 The results indicated that coated polymers had specific adsorption to PTL as compared with its co-occurring 5-hydroxymethyl-2-furaldehyde (hydroxymethylfurfural (HMF)), at the same bulk concentration for solution of PTL and HMF, the maximum absorbance in the solid-phase extraction (SPE) method to PTL were 93.97% or 0.654 μg/mg while to HMF they were 76.89% or 0.496 μg/mg. Scatchard analysis revealed that two classes of binding sites were formed in PTL-MIP with dissociation constants of 3.2 × 10−2 and 5.0 × 10−3 mg/mL and the affinity binding sites of 8.029 and 1.364 mg/g, respectively. The recoveries of PTL were more than 90% for the developed MISPE and around 75% for the traditional liquid–liquid extraction in spiked apple juice samples. It was concluded that the method is suitable for the scale-up synthesis of PTL-MIP grafted on silica, and the polymer can be effectively applied as SPE coupled with high-performance liquid chromatography (HPLC) for the determination of PTL in apple juice or other related products. HPLC chromatograms of loading, washing, and eluting fractions of PTL and HMF from the MIP cartridge. Test samples in each chromatogram from top to bottom: mixed standard of HMF and PTL (10 mg/L), residue solution through the cartridge, first elution and second elution washed with 1 mL of 1% (w/v) HAc aqueous solution. The online version of this article (doi: 10.1007/s00216-011-5282-y) contains supplementary material, which is available to authorized users. We gratefully acknowledge financial support from the Science and Technology Commission of Shanghai Municipality, project no. 06DZ05128.